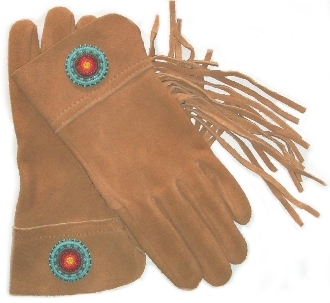 Since all gloves are hand made, we can not pick the colors of the beads. WE CAN NOT SPECIFY BEAD COLORS ON ORDERS. MFG SENDS SIZES IN ASSORTED BEAD COLORS. PLEASE, PLEASE, State that in the box that asks for your needed by date. Then we will have the warehouse pull the best male color they can. WE WOULDN'T WANT A GUY TO GET THE ONE WITH THE PINK BEADS.